Fundz Pro is responsive design from end to end, so you can access your feed on a desktop or mobile device. To receive real-time alerts and get the best experience when on a desktop use a Chrome browser and make sure you've installed the Fundz Chrome Extension. 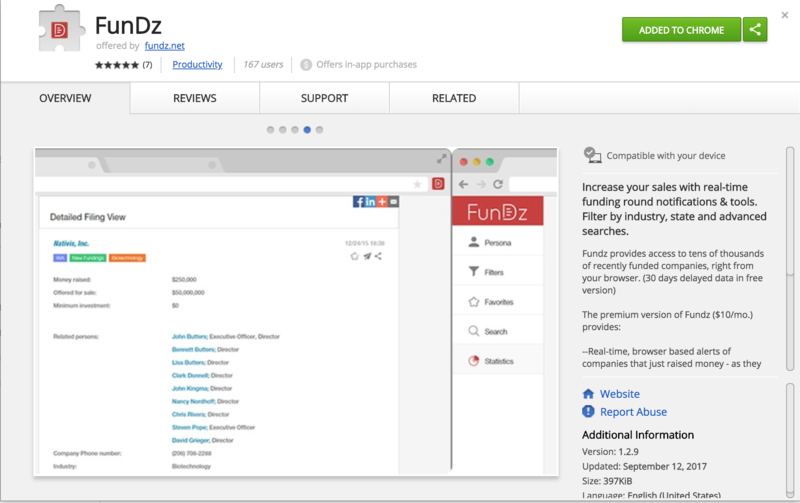 Once you've installed the Fundz Chrome extension on your desktop, you will see a red "D" shaped icon on the top right of your Google Chrome browser. Click on the icon and once you're logged in, you'll see a listing of recent fundings like in the picture below. To turn your real-time notifications on or off at any time, simply move the notifications toggle button in the top right to on or off. When you first log in, you are directed to the Fundz Filings page. You can always get back here by clicking the Fundz red logo in the top left of any page. On the left hand column, see you will see a menu. Click Filters. You will see a page that looks like the screenshot below. Here, you can make any adjustments at any time to focus on just certain funding ranges, industries and locations. 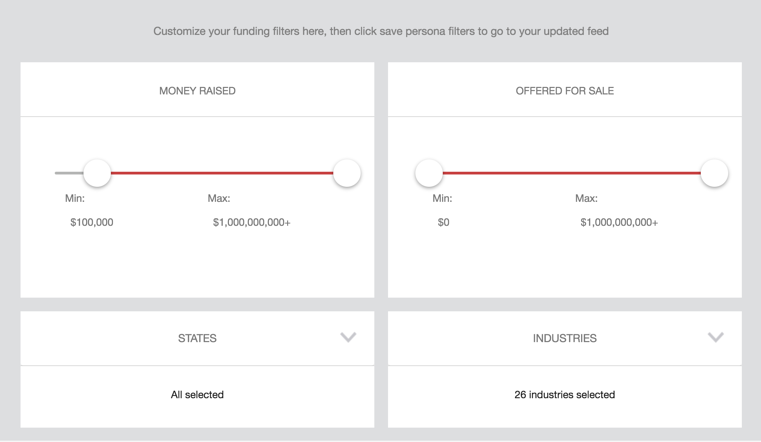 Note: By default, Fundz has already deselected industries where the fundings are usually just investment funds raising money and not startup companies raising money, so keep this in mind before changing the filters to "select all", as doing so will provide a lot of results in your feed that you may not be interested in. If you want to get very specific on setting locations, you can create your filter for just certain zip codes. If you do, make sure to follow the exact CSV format and header call of the example provided on this page. When done changing your filters, be sure to click save persona filters at the bottom of the page after making any changes, or they will not be saved. Near the bottom of the filters page, you will see a "Show Filings" section where you can select "New", "Amended" or "All". "New" is selected by default. Amended filings are not new filings, but rather amendments to previous filings. Fundz Search lets you quickly get all the recent fundings you are interested in by city, state, zip codes and industries. From the left hand navigation menu, click Export Deals. First, make any desired changes to the industries and location selections. Second, click the "search" button, then wait for the results below. Once the results show up below, the "send to email" button will become active and you click this button to send the CSV file to your email. Note: you can only receive up to 500 results per search, to minimize processing time. Simply narrow the date range, location and/or industry range and then run subsequent searches to get all the information you need. You can always get to your feed when logged in by clicking the Fundz logo in the top left. 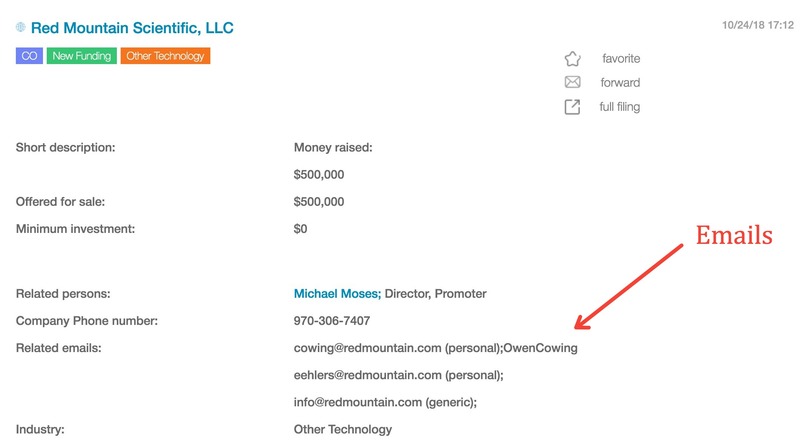 To get to the Company details page for any filing, just click on the company name in blue on the Filings page. 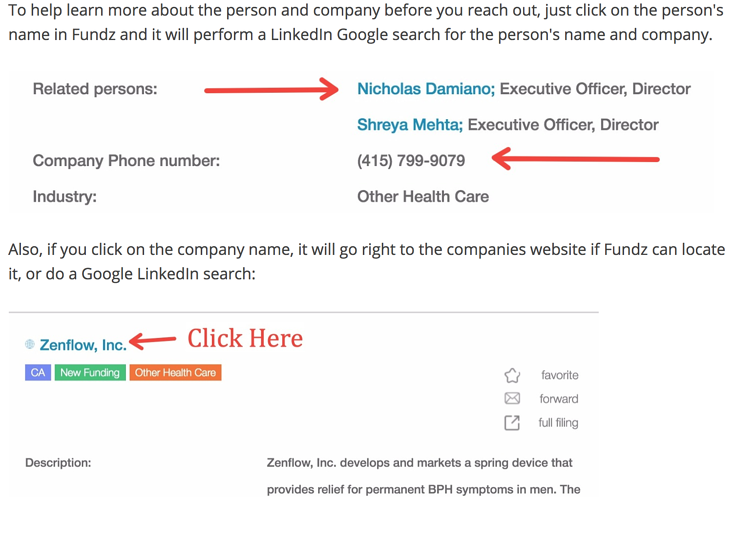 This will bring you to a company details page, like this example. 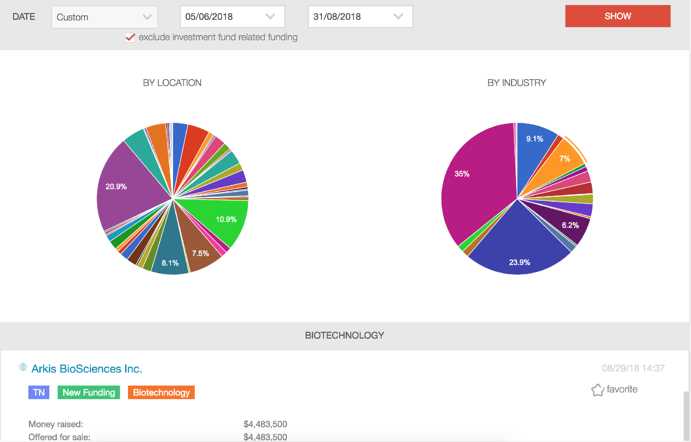 Statistics is a tab on the left navigation column that automatically shows you the percentage of recent fundings by location and industry, for your specific preset filters. You can also select custom date ranges at the top. Additionally, whenever you click into one of the pie charts, Fundz will list out all the fundings for the specified date range, for that location or industry. Just click the star icon next to the word "favorite" on the right side of any filing. This will save it under Favorites on the left hand menu. To add notes to any funding, just go to any detailed filing view and scroll to the bottom, there you will see a section where you can add notes. Be sure to mark as a favorite after you add your notes. Below is an example email sequence that has been effective in capturing new business with Fundz. I help growing (name of industry) companies accelerate their (business goals) through utilization of (description of your product/service). Usually when companies successfully raise funding, (achieving or improving) (above goal or challenge) is or soon will be a priority, so I thought it might make sense to reach out. I'd love to learn more about your company. Again, congrats! Not sure if you caught my email the other day. 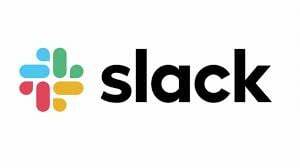 Again, just wanted to see if there was an interest in chatting for a few minutes about how (your company name) helps startups just like yours with (common challenge or goal). Let me know if I can help! I'd still be interested in connecting to learn if (your company) can help with reaching the goals you have in front of you associated with your recent round of funding. Sounds like you're all set, so will not bother you anymore. If I can help in the future, just let me know. Hopefully this is helpful for you to improve your outreach, connect rate and ultimately sales.